With the fall dairy shows quickly approaching, I can't help but think about all of the great times spent showing cows at the fairs. One of my Washington dairy friends flew out here to visit me for the weekend a few weeks ago and we went to the dairy show. That's my kind of weekend! Cow shows are a lot of fun. In fact, my favorite fair of all time, the Puyallup Fair - the Washington 4-H Fair and now officially the Washington State Fair - is in full swing and 4-H kids are set to show their cattle this week. Speaking of showing cows, I've seen several blogs and photos in the last few weeks about showing cows and why it matters. It DOES make a difference, especially for kids. Sure, you can learn a lot in the show ring and a lot about how to create the perfect topline, but it's the life lessons you learn throughout the year caring for your animals and throughout other aspects of 4-H and showing that really make a difference. I know I would not be who I am today or where I am without it. For me, those "annoying" demonstrations we had to do each year about various dairy industry topics made all the difference. I put 'annoying' in quotes because I hated these presentations the first year or two and that is exactly how I referred to them when I was 12. They were annoying. I didn't like them. I was terrified of public speaking. I didn't want to get up in front of the club and present something. No way. 4-H improved my confidence and made me realize that public speaking really isn't that scary. In fact, these days I think it's fun! Who would have thought that the shy girl that wouldn't talk to anyone for the first few weeks of kindergarten would grow up to love public speaking? 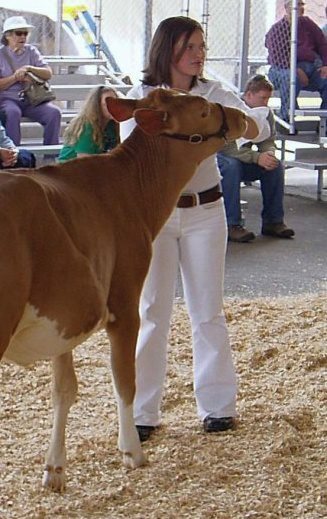 Public speaking is very relevant at the fairs since many fair goers often have questions about cows, farming and the dairy industry. Knowing how to confidently speak on behalf of our industry is key. I did teach my cow how to be photogenic...an awesome trait for a show cow to have by the way! Working together with others is a part of farming and applies to showing cows, too. When I first started showing cows, I didn't know what I was doing. Luckily, I had several amazing 4-H leaders and family members that were more than willing to help me. Granny helped with vaccinations and treating our show calves for ringworm. Mom helped hold my cow's head while I was trying to clip her head and the cow was trying to smash me against the railing. My 4-H leaders showed me how to lead a calf in the show ring. Others taught me what to do when the cow I was leading got out of control. I learned something from each of these folks, and these days I get to pass it along to others. At the fairs, we all had to work together to keep our area neat. Herdsmanship is a team effort. You learn to work with all kinds of people to achieve a common goal. You also have a lot of fun in the process. Showing cows teaches young people so much, but one of the most important things is how to care for an animal. We always had to make sure our cows' vaccinations were up to date, she was eating what she was supposed to and that she was healthy. The saying, "Take care of your cows and they will take care of you" is very applicable here. While we had to get the animals ready for the show just a few times a year, they needed to be healthy and cared for every day. Aside from cows, public speaking and working with others, the friends made in the barn at shows are some of the best. Watching the junior show Labor Day weekend brought back a lot of memories of my 4-H days, and it makes me happy to see these kids having the same opportunities that I did so many years ago. With the average age of the American farmer rising each year (last I heard it was 57 or 58), it's great to see so many young people with a passion for the dairy industry and agriculture. 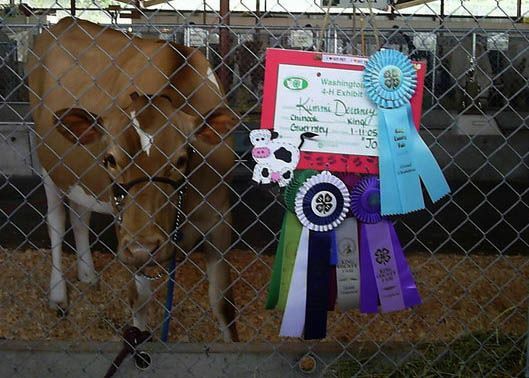 Winning the trophy and fancy rosettes at the show is nice, but there's so much more to showing cows than that. I can't think of a better way to learn about responsibility, public speaking, taking care of animals and so much more than by showing cows. It's also a terrific way to make amazing life-long friends. I know I did. Why do you love showing cows?